Askwith Forum hosted a panel with Jennifer Blatz, Michael McAfee, Laura Pinsoneault, and Paul Reville to discuss how to use collaborative actions to improve children's lives. 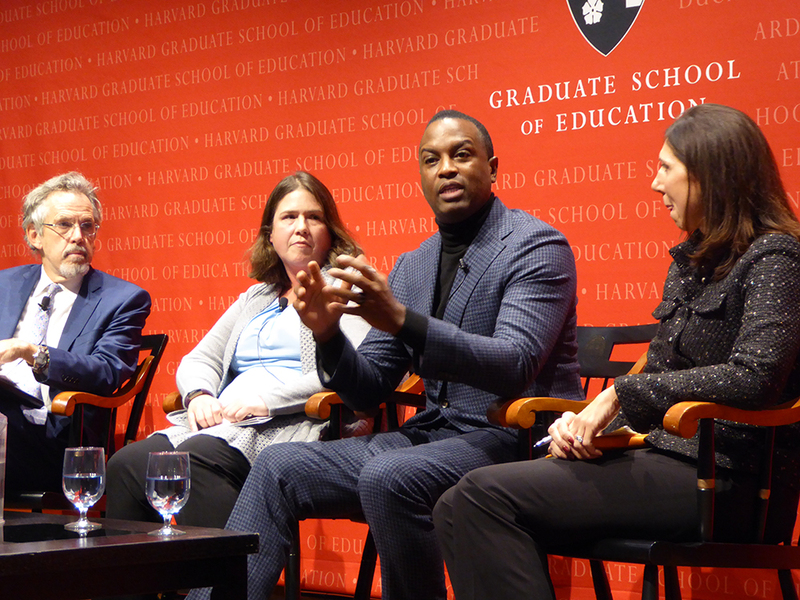 The Harvard Graduate School of Education’s Askwith Forum hosted a public panel, “Improving Outcomes for Children Through Collaborative Action,” about applying strategies to accelerate positive and equitable outcomes for youth education on Thursday evening. The panel featured a conversation between Jennifer Blatz, president and CEO of StriveTogether, Michael McAfee, president and CEO of PolicyLink, and Laura Pinsoneault, director of evaluation at the Spark Policy Institute and was moderated by Paul Reville, a professor at GSE. More than 100 people attended the event. Thursday’s forum was part of the Harvard Education Redesign Lab 2018 Leadership Institute, an initiative born from a GSE meeting in June 2017 on developing leaders to improve children’s education outcomes, according to Jennifer Davis, a Senior Associate at the GSE. At the panel, Blatz cited the importance of data analysis in her work in Portland, Oregon and Northern Kentucky schools. She emphasized using qualitative data, such as interviewing parents, to supplement statistics, and pointed to Portland as an instance of the success of this approach. When asked how he balances efficiency and equity when mobilizing his diverse community, McAfee said that efficiency is always secondary. McAfee underscored the importance of race in addressing educational disparities. “If you’re afraid to name your people, if you’re afraid to say black folk, poor white folk, or poor Asians, you can’t talk about equity and you’re not on the edge of anything but maintaining your position,” McAfee said. Pinsoneault spoke about a recent study she conducted examining the efficacy of the collective impact strategy, in which different organizations work together toward common goals. Collective impact, “in and of itself it is not the panacea for all of the hard work that has to happen,” Pinsoneault said. She recommended organizations focus on providing “backbone support” by developing effective leaders. Davis said she hoped the public, live-streamed forum would reach a broader audience.